Elemental Training is a system that unlocks at level 45 and can enormously increase a hero’s stats by consuming Elemental Dust. So how can we harness this power? Check out the brief introduction below to find out how to become a master of the elements. The Elemental Training system only applies to Heroes. The main character cannot be strengthened through this system. Elemental Dusts are the main material needed in Elemental Training. Players may acquire Elemental Dusts by participating in the Inferno. The Elemental Training system can be found in the character panel. There are three elements in total: fire, ice, and thunder. The damage caused is the sum of these three elements. The upper limit of Element Level is Lvl. 10 Star 10. There are three different modes of Elemental Training. - Normal mode has a normal chance of upgrading an element with a high chance of reducing other elements. 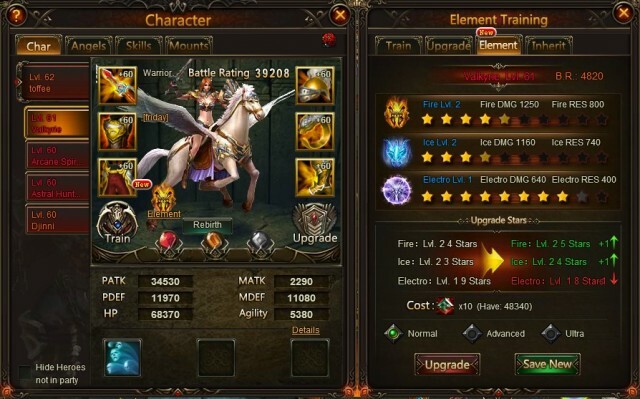 - Advanced training has a high chance of upgrading an element with a normal chance of reducing other elements. - Ultimate training has a high chance of upgrading an element with a low chance of reducing other elements. - Training costs 10, 20, and 50 Elemental Dusts respectively. - Click on the Upgrade button in the Element panel, and the 3 types of Element will fluctuate according to training mode you choose. If the stats change is satisfying to you, simply click on Save New to keep it. The target hero's and the source hero's Elemental Level and stats will be swapped after inheriting. The target hero will gain the source hero’s Element Level; the source hero will gain the target hero’s Element Level. Elemental Training provides effective damage perks. The Elemental damage effect is both efficient for skill attacks and normal attacks; it also increases skill damage coefficient, but is ineffective with countering skills. In the preliminary stage, players should focus on training offensive heroes.